Well now I ask the question -- who of you have added an audio system to your scooter? I know some of you are lucky to have one installed as standard equipment, but most of us are not so fortunate. I would like to hear from you as I don't like the idea of being the first to be a pioneer on this site. Going to You-Tube I saw a number of videos of systems built into the underseat compartment that I assume only can be properly heard with the seat up. I also saw one that the submitter said cost him only $40 and included two waterproof speakers. The amplifier had an AM-FM Radio and an audio input for an external MP3 player (Ipod) Well I went on Ebay under Ebay Motors and searched for motorcycle radios and found that unit and bought it for only $30. The picture above shows my installation with the two speakers and the radio mounted to two interlocking aluminum channel stock to contain the wires and fuses. The whole assembly is secured to the wind screen by the same 2 small bolts and nuts that secure my compass on the front of my wind screen. I must recompensate the compass settings due to the magnets in the nearby speakers. Testing the unit on my desk at home all worked fine, but on the scooter, that is another thing. The AM radio is not worth using as reception is very poor, but the FM radio works fine with the telescoping antenna that I added at the left side shown above the speaker. 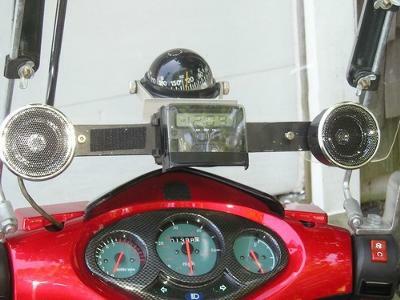 While this unit does have a digital readout for finding the stations, (and the time) on a moving scooter is no place to go turning the knob to tune them in. The amp section has only two six watt amps going to two 2" tweeter type speakers so don't expect to get any base response or to be distortion free at a volume that is louder than the street noise or your scooters exhaust. I decided to buy a MP4 player that handles everything and includes an FM radio that has the ability to have preset stations with the push of a single button. With a 4GB memory it hold all the music I need. So now I use the input jack of the radio and let my MP4 player do its job. The player also has the ability to add mini 2GB SD boards so I can keep plenty of music available for a trip. For $30 you get what you pay for. But I'm not happy.I expect to relocate this system to my electric three wheel scooter and install better quality speakers and either a high wattage stereo amp with my MP4 player supplying the input or buying another radio that has a built in SD card player for adding music from my computer to use directly so that I don't have to employ the MP4 player. NOW THAT i HAVE SPILLED MY BEANS, WHAT HAVE YOU DONE? Have a Tank 150. I put 2 small marine speakers in the Front Storage, hooked up to a small amp. I hard mounted under the control panel. Added a toggle switch so that it would not drain the battery. I also added a volume know for easy control...Drilled a hole and fed through an Earbud cord and soldered the ends onto RCA adapters and left the headset cord out through the hole and snapped a rubber gromit in hole to waterproof it. I bought a throw away MP3 player and used self tapping screws to attach a wide piece of velcro. When I want tunes I turn it on and velcro it in. super user friendly. Well! audio system for your scooter is a really different and I must say a good idea. Your idea and sound system thing is very creative and innovative. Nice blog. But in research papers help, innovation and creativity are very demanding and major upcoming topics of discussion. In which all the innovative and creative things are discussed. And this can be one of the things under discussion. It's a great idea. it is almost non existent to put a small sound system on my piaggio 350.i`ve seen some ideas that wont work because your sound system should be secure when you leave your scooter. i had an idea to save on under seat space. is to have a small stereo unit under the seat and a wireless or wired screen that displays your radio station and can be clipped to the windshield or handle baror something to that effect. As for the speakers, that became an issue because all scooters are not the same, so the best solution is to have a speaker put into each helmet and if you feel industrious have a speaker outlet some wheres around your seat to pluge in a battery powered speaker you can buy from crutchfield or C C crane. when you are off your scooter to relax and have lunch in your favorite spot. if i had the money to invest in this general idea i would. i realize that there is more development in this idea. I got two speakers with shock resistance. I Velcro'd them to the sides of my scooter and used the utility Velcro, which works great. I hooked my iPod up and it plays pretty good but I need a stronger speaker. I can hear it but not really good. I bought a charger to charge my speakers at night while still on the scooter and off I go. PS I got the speakers at best buy.